Controls bacterial spot, powdery mildew, rust, gray mold, leaf blight, scab and more. 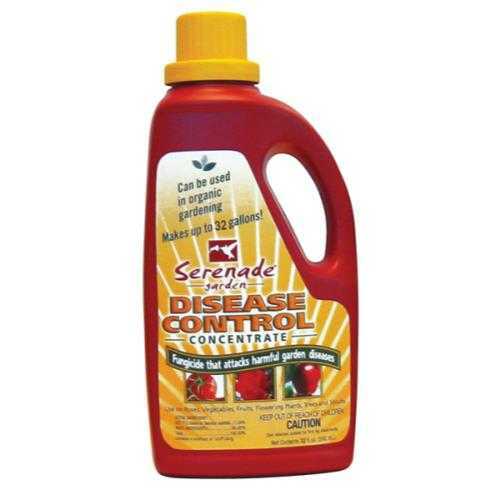 For home gardeners, Serenade® Garden Disease Control is the safe, natural, broad spectrum, effective fungicide that controls harmful garden diseases and is approved for organic gardening. Same effective active ingredients used by 1000's of commercial growers. Broad spectrum control of fungal and bacterial diseases. No weather or timing restrictions for application. So safe, you can treat, pick and eat fruits, vegetables or flowers the same day. No phyto-toxicity issues. Concentrate is 1 oz per gallon. Broad spectrum control of fungal and bacterial diseases. So safe, you can pick & eat fruits, vegetables or flowers the same day. Registered in all states.